Since its inception a decade ago, Marvel's Ultimate line of comics (which occurs in an alternate reality known as Earth-1610) has been entirely cloistered from the publisher's standard superhero books (which are set on Earth-616). For years, the "no crossovers" mandate reigned supreme. Heck, the entire concept of Marvel Zombies was initially written as a fake-out to fool readers into thinking Earth-616 and Earth-1610 were converging. When Spider-Man tracks down one of his deadliest villains, he suddenly finds himself thrust into another world where Peter Parker is dead…and there's a new Spider-Man in town. 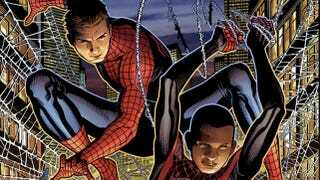 As these two heroes learn the truth about their identities and their universes, they'll embark on a journey that'll leave them forever changed-and reveal a startling truth about a key player in the Spider-Man mythos! This could actually be some pretty tear-jerking stuff, what with Earth-1610's Gwen Stacy still alive and Miles Morales feeling guilty that he was too scared to help Peter Parker in his final, fatal battle against the Green Goblin. Spider-Men will feature scripts by Brian Michael Bendis, art from Sara Pichelli, and covers by Jim Cheung (whose artwork is at left).